Gov. Paul LePage delivers a speech recently in Portland. SOUTHWEST HARBOR, Maine — Richard and Lorraine Stanley got the chance to go straight to the top Friday to talk to state officials about the economic challenges facing Maine’s boating industry. Gov. Paul LePage visited their boatyard, Great Harbor Boatworks, for about an hour Friday morning while on official business on Mount Desert Island. LePage also toured The Jackson Laboratory in Bar Harbor on Friday afternoon. LePage spokeswoman Adrienne Bennett said Friday morning that the governor’s visits were closed to the news media. Richard Stanley, son of local wooden boat builder Ralph Stanley, said Friday afternoon that he had invited LePage to the boatyard after finding out in September that he won a Maine Traditional Arts Fellowship grant for $13,000. Most of his business currently is boat storage and maintenance, Stanley said, but he hopes to get back to building a boat or two a year, which he has not done in about five years or so. Stanley said LePage toured his boatyard, located on Seawall Road, and that they discussed the regulatory climate in Maine. Stanley said he told the governor that he’s concerned about the financial impact some environmental and safety regulations are having on his and other boatyards in Maine. The cost of rebuilding boats has increased, he said, because of state requirements on containing lead paint. Six or seven years ago, he said, he had to spend $40,000 to fireproof some of his buildings and equipment in order to comply with workplace safety regulations. And he said he expects there to be new regulations soon that will restrict the use of chemicals to clean boat hulls. “It makes it very cost expensive,” Stanley said. Stanley said he does not want to harm the environment or put employees at risk, but said he would rather have a constructive regulatory climate that doesn’t resort to fines for employers who are trying to learn about the law. ‘I’d rather have them work with me,” Stanley said. LePage, the boatyard operator said, was sympathetic to his concerns. In an emailed statement, Jackson Lab officials said LePage visited the lab Friday to learn more about its research and to discuss the lab’s potential economic growth in Maine. In particular, he focused on lab research involving Department of Defense funding and veteran’s health, lab officials said. Accompanying the governor on the tour was First Lady Ann LePage and John Butera, the governor’s senior economic policy adviser. 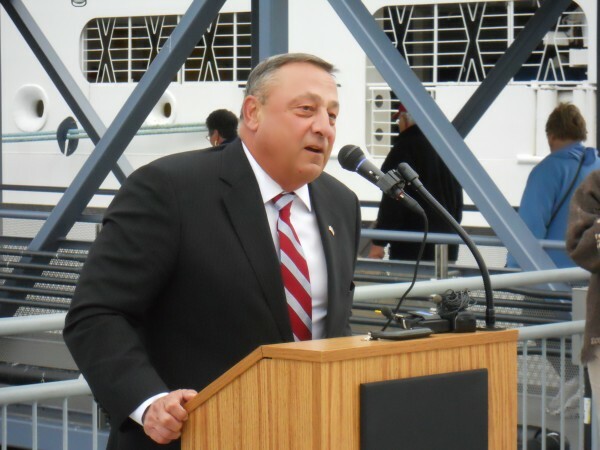 Bennett, LePage’s spokeswoman, said Friday’s events are in keeping with other visits the governor has had with Maine business leaders, often in private, to discuss what the state might do to boost job and economic growth in Maine. Bennett said LePage met with lab officials on Sept. 30 to talk about how the state could partner with the lab to help create jobs in Maine. LePage also got a private tour of the lab’s facilities in early August, when he visited the lab’s new wood-fired boiler facility and learned about the lab’s efforts with technology and manufacturing firms in Maine to spin off new tools and techniques developed by the lab into for-profit endeavors. Bennett said Friday that LePage understands why the lab announced late last month that it was planning to expand not in Maine but in Connecticut, where it plans to collaborate with the University of Connecticut Health Center in Farmington in building a $1.1 billion research lab that is expected eventually to create more than 600 research-related jobs. There aren’t enough biomedical research facilities in Maine for the lab to find collaborative partners for a similar project here, she said. “That kind of put us out of the running for having that particular facility being built here,” Bennett said. In 2010 and earlier this year, Jackson Lab had explored the possibility of expanding to Florida, first in Collier County and then in Sarasota County, but scrapped those plans after it became evident that the state could offer relatively little in matching funds. In Connecticut, state officials have offered hundreds of millions of dollars in state support toward the project and the expansion of the UConn Health Center. Jackson Lab officials have said they expect the Connecticut project to enhance the lab’s operations in Maine, where it employs more than 1,200 people. Jackson Lab, which also employs more than 100 people in Sacramento, Calif., and other locations, specializes in using mice to research human diseases and medical conditions. It breeds millions of specialized laboratory mice each year that are used in biomedical studies all over the world.